To purchase a hard copy of any of the plans, go to the Permit Center, Zoning Counter at 399 Elmhurst Street, Hayward, CA 94544. 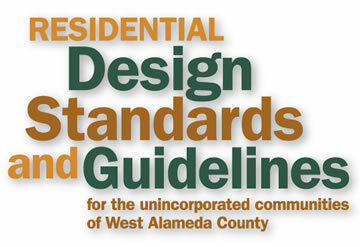 In October of 2014, Alameda County adopted the Design Standards and Guidelines to update previous standards and establish design guidelines for new residential construction and redevelopment projects in the unincorporated areas of West Alameda County. The Residential Design Standards and Guidelines will be used by developers to assist in the design of projects and by County staff, County decision-makers and the general public to review applications for proposed projects. The key goal is to provide clarity and certainty about site planning and architectural design expectations. The project area includes unincorporated western Alameda County, generally west of the East Bay hills, south of the city of San Leandro, north of the city of Hayward. It consists of the communities of Ashland, Castro Valley (within the Urbanized Area), Cherryland, Fairview and San Lorenzo. The area is approximately 22 square miles of urban and suburban land, with residential uses, built largely between the 1950s to the present, being the predominant land use. What are Design Guidelines and Development Standards? "Design Guidelines" are a set of discretionary statements and “Development Standards” are a set of threshold requirements. Both are intended to guide land development to achieve a desired level of quality for the physical environment. Design Guidelines function to preserve and enhance the desired character of existing neighborhoods and improve the aesthetic and functional quality of new development projects. Design Guidelines and Development Standards cover both urban and suburban development and are organized primarily according to land use and building typology, such as single, family, townhouse-type multi-family development, flats-type multi-family development on several floors, and mixed-use residential & commercial development.